Building resilience starts from day one, and the skills can be learned by all children including our most sensitive little ones, new research has found. Parents and professionals who work with children can help kids develop resilience by creating safe challenges, encouraging supportive relationships and teaching them to think positively, according to new findings from beyondblue. The research has been used to develop everyday strategies that can be applied in kindergartens, schools and at home to foster resilience in all children. To coincide with the start of the 2018 school year, beyondblue is launching web-based tips for parents and a new practice guide for professionals, called Building Resilience in Children aged 0-12. “Most of the existing research about resilience seems to focus on developing this skill during adolescence rather than the early years and through primary school, so we wanted to fill this gap,” beyondblue CEO Georgie Harman said. • Talking about feelings – encouraging children to discuss their feelings can help them better understand, and regulate, themselves. • Supporting independence – simple challenges can help them develop strategies to cope when they feel uncomfortable. Don’t be afraid to remove the training wheels and let them ride. • Building closeness with family and friends – knowing they are loved helps build self-esteem. • Promoting healthy thinking habits – positive thinking can be learned and used to overcome routine mental obstacles. The strategies are based on a 12-month research project lead by the Parenting Research Centre and Australian Research Alliance for Children and Youth. The project reviewed academic research and generated expert consensus on resilience concepts. This research was complemented by consultations with parents, children and practitioners from around the country. The work aimed to produce practical, evidence-based strategies for parents and professionals working with children, including early childhood educators, teachers and maternal child health nurses. “With a strong new evidence base, this material will help professionals and parents navigate the overwhelming volume of information about resilience that is publicly available,” Ms Harman said. The research was funded by beyondblue and major partner Future Generation Global Investment Company (FGG). FGG CEO Louise Walsh said the company was focused on delivering long-term funding for projects that would deliver meaningful impact. “beyondblue's focus on building resilience in children aged 0-12 is backed by the latest and most significant mental health research in this crucial early intervention space. We are delighted to have made this project a reality,” Ms Walsh said. Questions for the supplied audio grabs about the Building Resilience in Children age 0-12 Practice Guide. These provide context for the attached mp3 files 1-4. Question: Why has beyondblue made a guide about resilience? Georgie Harman: Everybody talks about resilience in kids, building resilient kids, making kids more resilient, but what does that actually mean? This guide is about getting practical, getting down to business. What can parents, teachers, professionals and other people who work with kids do every day to build happy, healthy, resilient kids? Question: How can parents foster resilience in their kids? Georgie Harman: Support your kids to be more independent, give them safe healthy challenges, don’t be afraid to remove the training wheels and let the ride. Let them lose at board games, at sport, so they learn how to deal with disappointment and if they fall, let them pick themselves up rather than doing it for them. The point is, kids learn from experience and it can help them. Question: What are the benefits of fostering resilience in children? Georgie Harman: Mental health problems start early, half before the age of 14. If we can get in early, teach kids some basic skills through parents, teachers and others, we know that we can prevent a lot of those mental health challenges later in life and we can also build a generation who if they do become mentally unwell, they can cope, they can recover quicker. Question: Are kids today too soft? Georgie Harman: I think the trick is to find the balance between nurturing your children, loving them, protecting them, but also giving them safe and healthy challenges, safe and healthy challenges are actually what kids need. We cannot wrap our kids too much in cotton wool. It will not help them as adults, it will not teach them the skills to be able to bounce back from the life adversities that will inevitably happen to us all. Housing approvals across the state continue to soar with over 70,000 home approvals granted in 2017, according to the Australian Bureau of Statistics (ABS). Minister for Planning and Housing, Anthony Roberts, said this was the third consecutive calendar year that NSW recorded more than 70,000 building approvals. “The rate of building approvals and completions in NSW is continuing to power the NSW economy and provide vital employment opportunities across the building and construction industry,” Mr Roberts said. Mr Roberts said almost twice as many homes were approved December 2017 compared to 2010, when, under Labor, only 36,828 homes were approved. “NSW is the number one state in the nation for housing approvals and continues to far exceed the Premier’s Priority Housing Target of 50,000 approvals per year which improves housing supply and helps to support housing affordability. The latest figures released by the Department of Planning and Environment show that Western Sydney remains the epicenter of the state’s housing construction with 27,540 new homes approved in the year to November 2017. “Along with our record transport infrastructure investment, these strong levels of housing approvals are vital to improving affordability and ensuring NSW remains number one. “And we are also ensuring that new housing is matched by more schools, hospitals, and green space”. Acting Treasurer, Victor Dominello said: “One of our Government’s priorities is to get more homes built and make it easier for first home buyers to enter the market and own their own home. “Thousands of people have taken advantage of the stamp duty exemptions and reductions to buy their first home, in the first quarter since the reforms came into effect”. The housing affordability package announced as part of the June Budget removes stamp duty for first home buyers for both new and existing homes for properties up to $650,000 and reduces duty for first homes between $650,000 and $800,000. “It is essential we prepare for the future by ensuring our children and grandchildren will have the opportunity to own their own home,” Mr Dominello said. OF FAKE NEWS, CLAIMING VICTORY OVER RESULTS OF UNIFICATION MOVEMENT and WHAT HARMONY ARE WE TALKING ABOUT? With this issue of the PCHN we put a dot to the long-winded story of unification movement that our publisher Evelyn Zaragoza began towards the middle of last year as a personal commitment, an advocacy, and a selfless cause so much so that it became the theme of the 23rd anniversary of this leading community newspaper. .
As in any arduously humongous task, we paid it a great deal of attention through to the minutest details. We encountered so many encumbrances but we were single-minded in trying to complete a task: With the release of the joint statement fully endorsed by PCC-NSW on the one hand, and APCO on the other, and with The Philippine Consulate harnessing both groups solidarity into some kind of a tripartite agreement, we can at least put the matter to rest. To many, this means: No more. Finito. The end. But to us, the story is not over yet. Truth to tell, the negotiations are far from finished. The two sterling groups still have to dot the i's and cross the t's, so to speak. There will be other meetings and hopefully more rewarding results for everybody let alone our entire commune. . But for us at PCHN, and for me as the principal writer-editor, two things immediately come to mind that need be expressed for mine/our own sense of distributive justice and conflict resolution. Firstly, and without self-aggrandizing, we say, WE DID IT. Whatever has been thought of against us, we achieved what we had aspired for, short of delivering what had been expected of us, although we never really promised anything let alone a rose garden. What can be more convincing evidence than the two official statements that materialised out of our news documentation and editorial opinions – the separate first statements by PCC-NSW and APCO INC. both sounding all-so-defensive and belligerent. Finally, with our constant egging of the Philippine Consulate through former Consul Marford who had publicly promised to organize this historic, milestone “reconciliation meet that became an agonizing wait-and-see if it happens. At the last days of the outgoing Consul’s extended stay in Sydney, his promise was fulfilled. Finally, the long awaited reconciliation meeting happened and brought forth a second, this time, and joint statement. At first glimpse, it seemed like a very promising position paper full of motherhood statements couched in diplomatic sophistries that bespeak of classic Filipino OPM (oh promise me) and bears the hallmarks of hypocritical stances ( “pakitang tao.”) – all of which remains to be seen as well as proven and tested in the long run. . In retrospect, we take credit for our sheer herculean efforts, no matter how self-congratulatory it may sound. After all, for two giants to react on record (i.e. their first separate statements), and then eventually get them to yield to a reconciliation meet we have pressed on so as to address issues we have tirelessly cavilled about is certainly no mean feat. That said, here comes our second other conclusion – a way of a rebuttal to APCO’s argumentation (nay accusation) charging us of “fake news”. From a more scholarly viewpoint, methinks there is really no such thing as “fake news” which became a sensational buzz word attributed to US Pres. Trump who first popularised it. The whole world especially Filipinos prone to aping, rumour-mongering, and crab mentality relished it to a point that it become a favourite byword or epithet. As it is nowadays, “fake news” is a two-pronged phrase taken to dismiss or legitimize any piece of information one disagrees with or intentionally deceive a desired target audience with outright lies masquerading as truth. Apart from dismissal and deception the other elements of fake news are malicious intent, causality of panic, confusion or disorder, and the awareness of the falseness of the news. In our case, had we been truly at fault as duly stipulated by APCO, then we would have been the first to publish an erratum and own up to our fault, me culpa. Besides we know that free speech, expression, or press freedom as it were is not absolute and that journalists and broadcasters are bound by a sense of professional responsibility, ethics, and code of conduct. That is a given, basic, and fundamental amongst those who profess to be journalists, broadcasters and other agents of mass media and communication arts be it electronic, digital or otherwise. “APCO is not in agreement with the proponents for “Unification” in many aspects; hence, the glowing reports about the “Unification” are fake, dishonest and fabricated news. We also denounce the writers for their fictitious, false and malicious reporting about the community: that the organisations lack government support because it is not united, that PCC is doing community development projects while APCO is into multiculturalism and serving only its members. Why tell lies if your intentions are really good? This is the final stroke -- a contradiction of the highest order. After all the brouhaha, they are actually in agreement with our editorialised call for reconciliation. In the first place, the impetus did not even come from us but from one Jhun Salazar, the fearless, level-headed ex-President of APCO. What is beyond me is how APCO could deny recognition of their own people even claiming that “ APCO Inc has not made any official stand on the issue of “Unification” and those who attended any meeting have denied ever declaring that they were representing APCO in any capacity” thereby committing more contradictions after contradictions. Remember, in community life, we are judged by the company we keep. Thus, the notion of being officially tasked or appointed to represent of any organization, APCO, PCC or non-aligned, is immaterial in a gathering of community leaders. There is such a thing as guilt by association. You can never dissociate yourself from a group you’ve been identified with from the very start .unless you relinquish it publicly or disclaim/disown membership/affiliation altogether. . The total effect is that APCO made fallacious statements that might sound reasonable or appear to be superficially true but are actually flawed or dishonest. Our turn to ask? What happened to APCO’s boast that they were going to circulate their statement even to national dailies? Has any negligible if obscure community digest ever bothered publishing it? (Really now, please pray tell. ).What publication would pick up a statement teeming with false line of reasoning to begin with? Who are you trying to fool? Sining niloloko ninyo? Wittingly or unwittingly, APCO’s argumentation is generally categorised as Appeal to Force, using force, the threat of force, or some other unpleasant backlash to make the audience (i.e. the Fil-Oz community in NSW) accept a conclusion that what we have reported are “fake news” , in short lies. This has obviously become their last resort in the absence of evidence or rational arguments that convince the reading public (i.e. subscribers and regular readers of PCHN). At this point allow me to differentiate between misinformation and disinformation and whether or not the “fake news” accusation of APCO to PCHN makes sense. .
Several online dictionaries make disinformation the far more sinister term, one that suggests a conspiratorial institutional effort. They define it as a false information deliberately and often covertly spread (as by the planting of rumours) in order to influence public opinion or obscure the truth. It further adds that disinformation is deliberately misleading information announced publicly or leaked by a government or especially by an intelligence agency in order to influence public opinion or the government in another nation. Sometimes this is regarded as propaganda. Often the defence, as in the case of politicians, is posited in the passive voice, "I was misinformed". This is how they rationalise their mistake in many instances when they are caught out trying to pass disinformation. In these cases however, the intent to deceive is originally and pellucidly clear except that it didn't work. In likewise manner, APCO did the same but for all intents and purposes, it boomeranged negatively on them yet served to positively increase our readership because people became curious to find out more about the whole shebang. We understand that most often than not, mis or dis information can be given innocently, negligently, or carelessly. And we go as far as sharing above vital info to point out precisely the baselessness and malicious intent of APCO in declaring us purveyors of fake news in their first issued statement following our editorial that obviously did not sit well with those who actually read them or heard them from others as second hand info. Aye, there’s the rub! Here lies trouble for they didn’t even bother verifying, vetting or ascertaining whatever dis or mis information might have been passed on to them. The evidence we have suggests that they never bothered to quote from what we have published WHAT PRECISELY they deem fake news. This kind of disinformation clearly implies that the person who wrote the statement for APCO is intentionally making a false statement that he or she knows to be false. On hindsight, this is funny pathetic given that APCO is seemingly hell-bent in proving to TPTB (the powers that be, who have decorated them with this and that award) that indeed harmony reigns amongst the Filipino community by their obvious act of “papering the house”, (a theatre expression meaning feeling the house with complimentary tickets to give the impression of a sell-out or as applied to local event organizers and their supporters, the closest Filipino translation is the “hakot:: syndrome). So much so that APCO’s gone out of their way to subsidize part of the expensive ticket to this years’ annual Harmony Premiere dinner to the delight of unsuspecting folks until one member threw the wet blanket in an act of rightful indignation and finally cried foul: “What harmony are we trying to prove when we cannot even harmonize with our very own community? . Or something to that effect. Well said. To this person who has the balls and gall to challenge APCO’s unseen hands but intriguingly felt touches of conjugal dictatorship, we say AMEN. For the entire community in general, it’s time to end anonymity and put a brave face to one’s stand. Let’s not confine ourselves to “bulung-bulungan” on the sides. Time is rife for people to come out and fearlessly say their piece with no strings attached. It took a long time coming. The clamorous and vigorous attempt to unify the Filipino community in NSW instigated by Evelyn Zaragoza, publisher of this newspaper finally came to a not-so-dramatic ending with the much-awaited RECONCILIATION meeting between the break-away groups of APCO with the mother organisation PCC-NSW over and done with, as dutifully engineered by the Philippine Consulate during the last remaining days of outgoing Consul General Marford Angeles in January 16, 2017. It should be recalled that since June 2017, a series of exploratory consultative and educative public forums were orchestrated by PCHN publisher Evelyn Zaragoza and duly documented by this writer-editor in banner headlines tracing the development of the UNIFICATION MOVEMENT in its monthly issues beginning June-July 2017 through to the present , generating a massive information campaign of underlying issues and concerns and publishing as well the consensus of opinions from various respected leaders and so-called movers and shapers of the Filipino-Australian society. Needless to say, it’s been in the works since perhaps the earliest recorded history of Filipino migration in Australia. As our population rose to become one of the top ten sources of overseas migrants, it is but natural that more and more intrinsic, internal, and germane conflicts floated along. It has been said that where there are Filipinos, there will always be disunity so much so that the issue of unification has grown whiskers. The longest surviving confederation of Filipino organizations is in itself fraught with political strife and coup attempts but nothing as major major as the famous walk-out of the Amoreses almost a decade ago and the consequent formation of the APCO has put PCC-NSW on tenterhooks enough to reinvestigate its reason for being. When all is said and done, the final verdicts as to the issue of reconciliations are simply NO RECONCILIATION! On 16 January 2018, the Philippine Consulate General in Sydney hosted a meeting between the leaders of the Philippine Community Council of New South Wales Inc. (PCC-NSW) and the Alliance of Philippine Community Organizations Inc. (APCO). The leaders affirmed their groups’ commitment to effectively serve their respective constituents and the Filipino community at large. They likewise both pledged to continue working with the Consulate in promoting and protecting the interests of all Filipinos in NSW. PCC-NSW and APCO will continue to carry out their respective projects and mandates, and work with the Consulate towards harmonizing their respective programs to maximize efficiency, resources and output. The Consulate will assist both organizations in exploring joint activities and other possible areas of cooperation, with concurrence of their respective memberships. PCC-NSW was represented at the meeting by its President, Ms. Serna Ladia, and Board Members Mr. Alric Bulseco, Ms. Mercy Jones, Ms. Angie Jenkins, and Ms. Rowena Gonzaga Turnbull, and APCO by its President, Ms. Pet Storey, and Founding President and Adviser Dr. Cen Amores, Immediate Past President and Adviser Mr. Ruben Amores, Adviser Mr. Jimmy Lopez and Asst. Secretary Linda Price. Acting Head of Post Consul Marford Angeles represented the Consulate, joined by Consuls Melanie Diano and Emmanuel Guzman. The parties plan to meet again in the next months, as well as maintain open communication and effective coordination into the future. PCHN conducted a quick random survey amongst the very same people who actively participated in the series of Unification Movement Public Discussions and culled the following initial feedbacks. Jhun Salazar, who for the record was the first ever who stood up and advanced the notion of “reconciliation” between APCO and PCC, has this o say: (EVELYN NASAAN ANG COMMENT NI JHUN. PASULATIN MO SIYA NG SINASABI NIYA SA IYO PARA SA KANYA MAGSIMULA PLEASE). Who does not know Blacktown Councillor Jess Diaz, the first Filipino political face NSW has ever encountered. He said “Good dialogue, warm relationship, motherhood statements! Unification? No. Focus on goals and forget and bury unification for another day. Worse, we get an honest, in-the-face reaction of an adopted Filipino supporter Robert B. D. Bock, who dismisses the whole shebang thus: “I’m sorry but it looks like same old, same old (faces.) Where is the new blood? As always there are two sides to a coin such that there are likewise more welcoming, positive comments to lend some balance. Atty. Tom Baena is perhaps the first Filipino elected director of a huge RSL club who is quick to gush: “One small step taken by a few leading to a giant leap of community harmony and prosperity. “It is wonderful to know that both parties have agreed to work together for the good of the Filipino people. The people around us are fully aware of the great contributions that we have as part of the community. Filipinos are full of enthusiasm and charisma. Wherever we are, we excel. Our goal is to encourage and lift each other up. And be there for the good of all not for personal gain. Having a humble heart will make it happen. This is what both parties are doing. Well done! As we continue with our desires to move on and focus more on the positive, with the help of God, we all can do what needs to be done. Let us be a blessing in the lives of others. With many willing hands to do the work, we can accomplish much.Thank you everyone. “The key message of the tripartite statement issued by the Philippine Consulate, APCO and PCC - NSW ( to me an agreement that will bind the three parties) is that each can continue their own projects and activities and work with the Philippine consulate to harmonise these activities. Also by this statement both APCO and PCC - NSW can explore and undertake joint projects with the concurrence of their respective memberships. For me there is one important ingredient that is missing on this agreement and that is an agreement to meet regularly ( say quarterly) to explore joint projects that will help the Filipino Australian community. The Statement only states that the parties will meet again in the next months. The statement / agreement for APCO and PCC - NSW to meet regularly with or without the presence of the Philippine Consulate will enhance the prospect of both parties exploring joint projects and advocacy beneficial to the entire Filipino Australian community in NSW. One such project is a functional Filipino Australian community centre. We have already the MPC in Blacktown and what APCO and PCC - NSW is to explore on ways of improving the community centre to become a truly functional centre thru the support of Federal and NSW state governments and Blacktown City Council and the support of Filipino Australian community. This is a project that is achievable with joint commitment of APCO and PCC - NSW in coordination with the present management of MPC. “Many thanks for sharing this email/letter from the Honourable Ambassador Cruz to our good friend Mars. In regards to the contents of the article between PCC-NSW and APCO. I personally feel that genuine reconciliation between these 2 groups will ot succeed this year or perhaps another year or years (who knows). As a former OFW community leader in Saudi Arabia for 22 years, I had this kind of experience before and it took years to resolve and not even the Philippine Embassy and Phil Overseas Labor Office/OWWA intervention worked. As always, the problem of factionalization and tribo-tribo system is always at the center stage. There was an absolutely ethnic divide syndrome in terms of running a a pinoy community organization aroudn the globe and there's a number game approach which plays an important role to gain leverage on every issue whether an Ambassador or Consul is present to mediate between warring factions. Perhaps our crab mentality will never wane wherever we are and wherever we maybe. It was a exhausting and draining experience to be a part of any group meeting involving pinoy association/organization and based on my experience, every elected leader does not want to give even an inch to every argument/deliberation whether it's a planned community event or cultural celebration and for me, it's just a waste of precious time of every attendee as it was a never ending story of proving who is the best among the rest on every issue the protagonist deliberate. Right now, I believe that unless PCC-NSW and APCO back down from their recriminating ways of dealing with any concerned issue(s), genuine and lasting reconciliation between these 2 groups will never be attained. At this point in time, we can feel and see total disenchantment from the pinoy community in general as they await the result of this reconciliation process. I believe it will be a long and tedious work in process for all the involved parties to come up with an effective formula to bring and achieve peace and harmony in NSW that we clamor for so long and after many years of failed expectations. For now, I am not losing hope and I continue to pray that one day, everybody will say - 'We are ready to unite and work for the common good of all of us pinoys in NSW. Unless this happens, we have to live by the day and as we pinoys say - Pagpapasa- Diyos na lang natin ang kahihinatnan ng walang katapusang pagsubok at pakikibaka sa ating buhay kahit saan man tayo naroroon"
“I have read through the statements, and I have attended at least one your 'unification' meetings. In response to your request for comment, I have this to say: Personally, this issue of 'unification' or 'reconciliation' does not affect me. Further, I believe that the issue has no real impact on the larger number of Filipinos in Sydney or across Australia. The organisations involved with PCC-NSW, APCO - or the FILCAA for that matter - comprise only a very small section of the total number of members of Filipino-Australian community. They do not represent the rest of the Filipino community who are not members of these organisations. 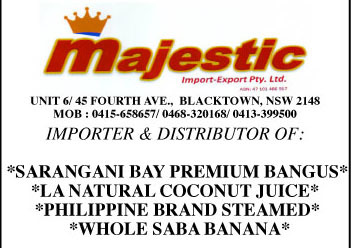 In effect, they do not represent every member or a great majority of the Filipino-Australian community. That said, I would like to see these organisations on friendly terms, working alongside each other on occasions. Whichever was founded first is of no great importance to me, especially considering that the truly first Filipino-Australian organisation in Sydney - and in Australia - was founded back in the mid-1960s - as was the first Filipino 'Federation' - both of which, as far as I know, have been defunct for decades. What I know is that conflicts among Filipino-Australian organisations reflect badly on all of us, and not just on the organisations. This is another reason why many members of the Filipino community do not join existing Filipino organisations. I am a member of the Ateneo Alumni Australia, but I have always resisted this organisation's joining the PCC-NSW precisely because I could see it being dragged into the conflicts of a larger organisation with agenda that do not represent the true spirit of my old school in the Philippines. A sticky point of conflict has been the idea of holding only one Independence Day Ball, organised by only one organisation in collaboration with the Philippine Consulate in Sydney. This seems unreasonable to me, even ridiculous. How could one fit in every member of the Filipino community - and friend - who wanted to celebrate Philippine Independence Day in single ballroom? The idea behind being able to accomplish this has been to price admission tickets beyond the affordability of the Filipino-Australian majority. The idea of democracy gives way to an elitist minority. My view is that the Philippine Consulate or the Embassy holds a Philippine Independence Day Ball on their own. After all, it's a 'Philippine' celebration ~ but open to any member of the Filipino-Australian community on a first come, first served arrangement. The Filipino-Australian community should then be able to hold their own Independence Day celebrations wherever and whenever. I wish your efforts in bringing 'peace' among the existing Filipino community organisations in Australia. And I wish these organisations would swallow their pride and co-exist without trying to outdo each other.